New Magnetic Cable-Safe from Serpent & Dove provides a simple and speedy way to get hazardous cables and hoses off the floor in work areas. 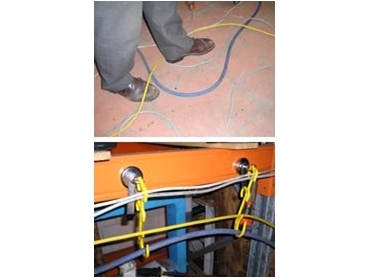 Magnetic Cable-Safe employs a universal cable hook and a strong neodymium permanent magnet, which will clamp to any nearby steel surface to retain up to 14 Kgs of cables or hoses per unit. A handle provides leverage for easy removal of the magnet from a surface.